We all want quality health care providers we feel comfortable with; ones we can see without a weeks-long wait; ones who offer an informed opinion; and especially ones who welcome us. Sometimes this is a challenge. Not only is there an overall shortage of health care professionals in Sussex County, but the situation can be compounded when LGBTQ patients are seeking welcoming practices. The good news is that there is now a Directory of LGBTQ-friendly providers online at camprehoboth.com. Listed under “Resources,” the Directory contains names, contact information, and medical specialties for multiple provider types. Each provider welcomes LGBTQ individuals as clients, and comes recommended for quality care and services by members of CAMP Rehoboth’s community. The Directory is dynamic; as it grows over time to include additional providers, it will become an even richer resource. One route CAMP Rehoboth has taken to pursue its health and wellness mission is to develop and—with the help of many community partners—disseminate an online, health-related survey—Assessing the Health of Our Community. Launche d in October 2017, the survey included 48 questions. Some were merely demographic, asking respondents’ ages and ZIP codes. Many questions asked about health conditions, like diabetes and heart disease. Other questions focused on health risk behaviors, such as tobacco and alcohol use, and on barriers to health care, like lack of transportation, or distance to health care facilities. Over 400 people anonymously responded to the survey. Because there were large numbers of respondents in various sub-groups—e.g., cisgender females, cisgender males, people in three age groups of interest—aggregated survey results could be examined for both the overall group of people filling out the survey, and also for sub-groups. Although there were fewer than 20 transgender respondents, it was even possible to do some broad comparisons of this sub-group’s aggregated responses to those of other sub-groups. In examining barriers people encountered in seeking health care, survey respondents were asked if the availability of adequately trained health care professionals was a barrier to health care. Just under one-quarter (24%) of respondents indicated this was a major barrier; similar percentages of cisgender females and cisgender males indicated the same. A slightly higher percentage of respondents less than 55 years of age (29%) indicated it was a major barrier, while a substantially lower percentage of respondents age 65 and older (16%) did so. 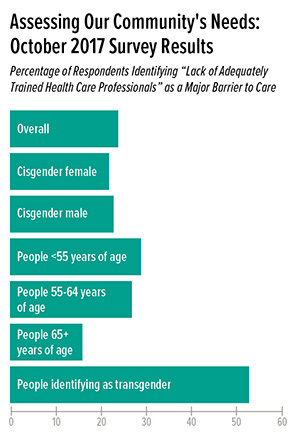 Over half (53%) of transgender respondents indicated this was a major barrier. Differences across the sub-groups are not surprising. For example, access to health care providers is often associated with having health insurance. As most people age 65 and older have Medicare, a lack of health insurance among people in that age group is less likely to be a factor in accessing health care. Conversely, transgender people may have health care needs related to being transgender, so finding providers with transgender health care experience may be more challenging. This may contribute to the larger percentage of transgender respondents reporting a problem finding access to adequately trained professionals. The survey findings are proving helpful in many areas. In the case of barriers to accessing adequately trained health care professionals, CAMP Rehoboth’s Health Providers Directory is one resource that can help overcome that barrier. All held at CAMP Rehoboth Community Center unless otherwise noted. Visit the website (camprehoboth.com) for additional information. Broga: Yoga for men of all shapes and sizes. Classes meet every two weeks on Saturday mornings, starting at 8:30 a.m. Next class: March 2; $10 fee per class, payable at class. Tai Chi: All ages and fitness levels welcome at these free sessions devoted to the practice of the ancient Chinese system of mind-body-spirit health. Classes taught by certified Tai Chi teachers; meet Wednesdays at 1 p.m.
Alzheimer’s (or Other Dementia) Caregivers Support Group: Provides a safe place for caregivers to discuss challenges, share information, and support one another. Professionally moderated; meets second Wednesday of each month at 6:30 p.m.
Grief Support Group: A safe and welcoming space for those struggling with grief and loss, no matter where individuals are on their grief journeys. Facilitated by a certified End-of Life and Grief Coach; next meets at 3:00 p.m. on February 28. Parents of Transgender and Gender Nonconforming Children Group: Network in a safe space with other families who are going through similar experiences raising their children. Meets last Tuesday of each month at 6:00 p.m.
Medicine Wheel Journey: Gather around the stone circle in a sacred space to track personal evolution. Meets last Sunday of each month at 5:00 p.m.
Women’s Coffee Talk: Everyone’s welcome! Come share thoughts and perspectives, make new friends, and be part of the community. Meets first and third Saturday of each month, beginning at 10:00 a.m. Whenever you need it! Testing is available at multiple sites—and at convenient hours—in Sussex County. Contact Salvatore Seeley at CAMP Rehoboth to make an appointment.